‘You mustn’t throw away any part of the pig!’ This is a Sicilian traditional saying that we apply in our manufacturing. Indeed from the belly we obtain the Nebrodi Black Pig Bacon. It shows an irregular shape and a white fat layer. The pink threads (more or less dark) are the lean parts of the product. 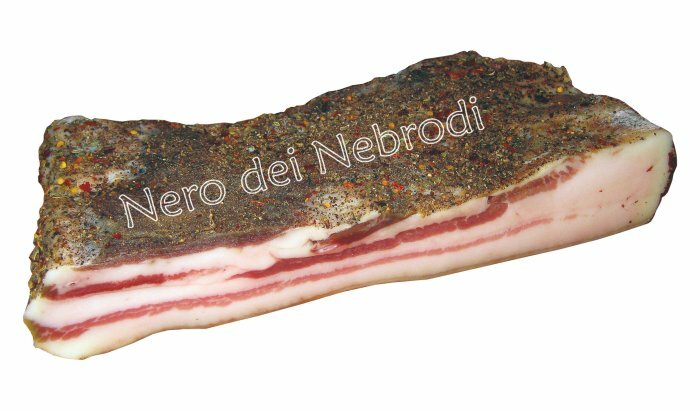 Here there is another thing: our Nebrodi Black Pig Bacon has the rind (pigskin). Therefore you can find it useful for two reasons: as a natural chopping board and to preserve the product. What about the taste? It is soft. A perfect equilibrium between sweet and spicy. First of all you can use our Nebrodi Black pig bacon to prepare a “sweet” carbonara. Or you can try to wrap in it less savoury meats. An alternative way can be to use it as ‘side dish’ with peas. The 20 days seasoning guarantees its soft taste, which permits you to combine it with other dishes to aromatize them. Consistency: Depends on the duration of curing. Trivia: It is obtained from the belly of the pig and may or may not have a rind. The bacon is produced using traditional methods without the presence of additives and has a faded red colour.